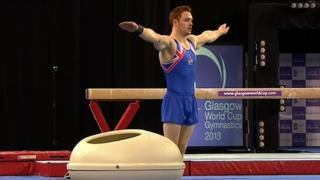 Watch Dan Purvis's floor routine at the the 2013 Glasgow World Cup, where the Great Britain gymnast finished with a silver medal. The brilliant routine earned him the highest score of 15.433, but Purvis was pipped to the title by Oleg Verniaiev of Ukraine. Purvis led through the first four apparatus, but Verniaiev moved into first place following his parallel bars performance and held on to it after the high bar.